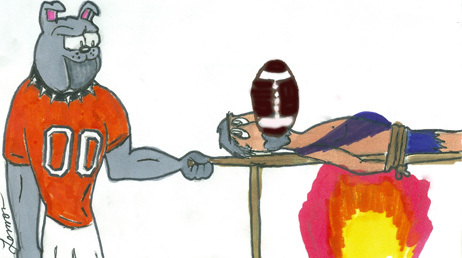 An Artesia Bulldog tries his hand at prehistoric home cooking, roasting a Carlsbad Caveman over an open fire in this drawing by Artesia High School senior art student Maegan Lemon. The ‘Dogs and Cavemen will square off at 7 p.m. today at Ralph Bowyer Stadium in Carlsbad in the 101st battle of the Eddy County War series. Fans are, as always, encouraged to turn out early, as seating is often limited. Mild breezes – the product of Thursday’s rain showers – blew down Main Street this morning, ruffling the Bulldog flags lining the downtown district into a corridor of proudly-waving orange. The first day of any new football season in Artesia is always a festive affair, but for the second consecutive year, it now comes with an added jolt of excitement: It’s Eddy County War time, as well. While some still wish there was time for a little more build-up, others have embraced the prospect of two of the state’s oldest rivals kicking off a new campaign against one another. This year’s meeting at Ralph Bowyer Stadium in Carlsbad marks Battle No. 101, and that kind of history is not lost on the boys who’ll be donning the orange and blue. Adding to the Cavemen’s “Beat Artesia” mentality tonight will also be the desire to start their 2017 season off on a positive note, thus erasing the memories of a 4-6 finish and a playoff miss in 2016. Head coach Gary Bradley’s boys in blue opened last year with a 30-14 loss to the Bulldogs at Bulldog Bowl. That outing saw Artesia up 20-7 at the half, and while the two squads finished close in terms of offensive yardage, the ‘Dogs’ overall clean execution gave them the clear advantage throughout. The Cavemen will be returning a few familiar faces in 2017. Back Jaykan Willis, receiver Jordin Molina, and offensive linemen Thomas Duran, Jose Navarro and Nate Dorado all return, with Molina and Willis also back in the cornerback and safety positions respectively. The pair are among six total Carlsbad players who start both ways. That number comprises all members of the team’s offensive skills set. “They’ve got some good kids back, they’ve got some good skills kids, and then they’ve got some kids we haven’t really seen before,” said Henderson. “They’re going to look a whole lot better than they looked in their scrimmage, because that was two weeks ago. Apart from execution, which will be the primary determining factor, Henderson will also be looking for Artesia’s kicking game to rise to the occasion in their first real test. “You don’t scrimmage that, you don’t run it live a whole lot, so it’s kind of a hidden aspect of the game until you kick off on that first Friday night,” said the coach. “Then you throw some guys out there and see what they can do. As for the Bulldogs, the squad looked crisp, for the most part, in their scrimmage last week against Las Cruces Onate. Back under center for his second season will be senior quarterback Taylor Null – who was 17 of 30 for 219 yards and three touchdowns against the Cavemen a year ago – and he’ll have some comfortable targets from 2016 around him in running back Robert Fernandez, backs Tyler Greenwood and JR Bustamante, and receiver Joe Willingham. On the defensive side, meanwhile, linebackers Miguel Martinez, Jorge Avitia and Blake Pruitt will once again be on duty, as will Eddie Pando on the line and Denver Williams in the secondary. Outside of those athletes, however, the ‘Dogs will be using today’s game as a major evaluating tool for their new and untested athletes. “We’re still trying to make sure some of our younger athletes even know where to be,” Henderson said. “We need to make sure everybody’s in the right place at the right time. We’re trying to advance and put on some new things, but mostly tonight, it’s going to be about refining what we’re already doing well.